Japanese cuisine includes the many different culinary traditions of Japan. Every region in Japan has its own tradition about cooking. Foods eaten in Japan also reflect the history of the cultural exchange between Japan and other culture. Since the modern times, the influence of the West inspired Japanese culinary tradition to invent new dishes, some of which have become popular not only inside Japan but also outside. However, most of the culinary traditions of Japan commonly think that seasonality is important. Soya beans are a very important ingredient in Japanese cooking; it is used in soya sauce, miso and tofu. Soya milk is also used as a drink. One example of a dish with soya beans in it, is tofu. Tofu is made from pressing soybeans into cubes and then boiling them. Tofu is often in soups and stews. Deep fried tofu is also used in many popular Japanese dishes, for example as kitsune udon and inari sushi. Soya beans also have omega 3 fatty acids, that can also be found in salmon. Noodles (like in most Asian foods) are used often in Japanese foods. The dishes usually come originally from China; nevertheless they have reached a unique development in Japan. 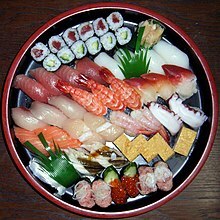 Japan is surrounded by the ocean so there is a rich variety of seafood which is an important part of Japanese cooking. Japanese people did not eat meat until the Europeans first came. Fish was the most common food. Shabu shabu is meat (or other protein-based food) and vegetables boiled in a simple broth flavored with seaweed and/or fish. Each piece of meat is put in the broth for a short time. Wasabi is Japanese horseradish. It is often a green paste used with sashimi and sushi. Wasabi is also used with many other Japanese foods. Wasabi is sold as a paste or in powder form. Wasabi powder has to be mixed with water to be turned into a paste. Wasabi has a strong, very spicy (hot) taste. Sashimi is very thinly cut raw seafood. Many different kinds of fresh fish and other seafood are served raw in Japanese dishes. Sashimi is one of them. It is almost the same as sushi, but it has no vinegar rice. When the slices of fish are put on small pieces of rice they are called "Nigiri Sushi". Sashimi is artistically arranged and put on the plate on top of shredded daikon and shiso leaves. The fish pieces are dipped into soya sauce before being eaten. ↑ 岡嶋芳枝. "世界の小麦料理、日本からは". Nippun. Retrieved 2016-02-01. This page was last changed on 7 March 2019, at 09:45.